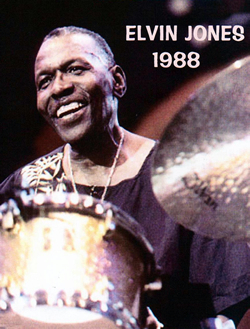 Certainly, we all love Gene and the rest at JazzLegends.com, but it is about time that we offered something from another true master, this one of a different style and era, Elvin Jones. There hasn't been much out there on Elvin other than the programs that have been on the market for years. We wanted to wait until we found something extraordinary and we believe we have. "Elvin Jones: A Love Supreme," is a 1988 Coltrane tribute concert, recorded in Japan with Freddie Hubbard on trumpet and flugelhorn, Sonny Fortune on tenor saxophone, McCoy Tyner on piano and Richard Davis on bass. Superbly filmed and recorded, this clocks in at almost two hours, and is the most "accessible" example of latter-day Elvin we've found, in that the compositions include "Body and Soul," "I Want to Talk About You," a couple of swinging blues, and the title tune. This is a great, great intro to Elvin, perfect for those who want to learn just why he was a legend.